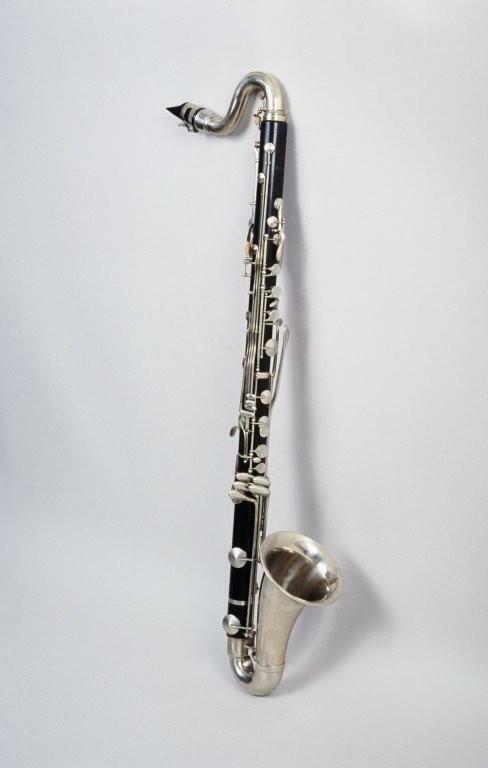 Bass clarinet. Nominal pitch: B?. Technical description: Blackwood with german silver keywork, ferrules, crook and brass bell. Five pieces: mouthpiece, crook, upper section, lower section, upturned bell. Ebonite mouthpiece with a long table; with ligature. Goose-neck crook of german silver with chimney and tone-hole for one of the two speakers. Liner does not project into bore.Upper section: Two speakers, one to overblow at the crook, one on body for throat B?. Chimney on upper section does not project into bore.All tone-holes covered. Two sling-rings (one on each section) and shaped thumb rest on lower section. Extension to E?. Key head and tone-hole for the lowest note on bell. L0: Plate + vent F3/C?5; speaker 1; speaker 2. L1: Plate + vent F?3; throat A? ; throat A?. L2: Plate + E?3/ B?4 correspondence. L3: Plate; cross E?3/ B?4. L4: C?3/G?4; F2/C?4; E2/B?3; F?2/C?4. R1: Plate; B? via correspondence; trills 1-2-3. R2: Plate B?2/F?4; B? via correspondence. R3: Plate B?2/F?4; B? via correspondence; cross B?2/F?4. R4: G?2/E?4; E2/B?3; F2/C?4; F?2/C?4; E?2. Keymount type: pillars. Keyhead type: modern. Repair History: Originally compass to E?, the lower section has been extended at the bottom with an extra piece of wood with one key-hole and the keywork modified. Stamped and gilded at top of upper section "V. KOHLERT SONS / MAKERS / GRASLITZ / CZECHO-SLOVAKIA" / seven overlapping medals, the central three containing "CHICAGO", "PARIS" and "LONDON" / B? / 754". Mouthpiece stamped "Vandoren / PARIS / B45"; reed cap "SELMER". Crook, lower section and bell unstamped.